The Bust Dime, so called because it features a bust of LIBERTY on the obverse, or front, of the coin, was the first US dime produced for circulation. It shares its design with other circulating coins of the time, including large cents, half dimes, quarters, half dollars, dollars, and gold coinage. 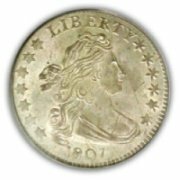 There are two types of Bust Dimes - Draped Bust and Capped Bust. Below you will find more information both, including varieties, composition and mintages. 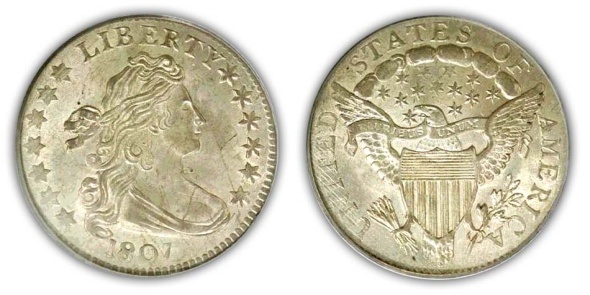 The Draped Bust design matched other coins of the time with Liberty featured on the obverse (front) and an eagle on the back that was highly criticized because it looked "scrawny". This variety is now known as the small eagle reverse (1796-1797). The heraldic eagle reverse, patterned after the Great Seal of the United States, appeared in 1798 and was more widely accepted. This new design for the dime piece received a whole new look. The bald eagle is on the reverse holding three arrows for strength and an olive branch for peace. This is the only time that a dime piece noted the denomination on the coin. Later coins would include the words "ONE DIME". A U.S shield covers the eagle's breast and "10 C." rests near the bottom of the reverse. In 1828 the diameter was slightly decreased and the coin was made thicker in order to contain the required amount of silver content. This came about due to new technology that was put into practice........A restraining collar was used when striking the coins. This kept the coin from spreading as far and at the same time reeded the edge. The process of placing reeds on the edge was previously done by hand, so this new procedure speeded up production time. This new process also made the coins more uniform in size and easier to stack. For some great deals on U.S. Bust Dimes and Coin Supplies visit my friends at Jake's Marketplace, Inc. They have a very comprehensive selection to choose from and give great discounts!